STREET CAR 7.0 FRIDAY - 100% Payout, $100 Buy In. Entry into this event also provides entry for the driver only. Three crew bands are available for purchase for each entry. RULES BELOW. SMALL TIRE BRAWL - SATURDAY $5K - $200 BUY IN. SMALL TIRE BRAWL - SATURDAY $5K GUARANTEED - $200 BUY IN. TOP 16 IN POINTS WHO HAVE ATTENDED AT LEAST 6 EVENTS WILL BE INVITED TO THE FINALE FOR THE $20K GUARANTEE. Entry into this event also provides entry for the driver only. Three crew bands are available for purchase for each entry. RULES BELOW. AT ANY TIME DURING THIS EVENT, ANY PARTICIPANT CAN BE INVITED TO THE STREET OUTLAWS INVITATIONAL. Entry into this event also provides entry for the driver only. Three crew bands are available for purchase for each entry. RULES BELOW. DOOR CARS ONLY - RUN WHAT YOU BRUNG. Entry into this event also provides entry for the driver only. Three crew bands are available for purchase for each entry. RULES BELOW. The band can only be purchased at the time one of the driver entry tickets is purchased. The band is valid for Friday and Saturday. This band gets one crew member entry into the venue for the weekend. This band allows the crew member access to the staging lanes and starting line ONLY when the car they represent is about to race. Once the car has run the crew member must vacate the starting line. RACER REGISTRATION for all classes. There is limited availability for each individual event. Pre registration is highly suggested. We reserve the right to close down registration once the classes are full. Schedule of Events and Rules for classes open to outside registration. General Rules for Each Class. 1. The racemaster has final say in all calls and discrepancies. 2. All races will be 1/8th mile, heads up, from a dig. 3. No times will be shown and no time slips will be given. 4. This is a NO PREP race. The racemaster will have sole discretion as to all maintenance done to the surface of the track. 5. All racers must attend a mandatory drivers meeting before each round. During the drivers meeting the racemaster will go over the rules and do pairings. 6. Pairings and lane choice will be decided with a chip draw. 7. Each racer can only draw one BYE. Competition byes do not count towards this. 8. The timing system will be determined by the racemaster. The racemaster will relay the specifics of the timing system during the drivers meeting. 9. If you jump, you lose. The red light means the race is over and the win is automatically given to the other driver. Chase is NOT a race. 10. WATER burnout only at the racers meeting, racers to decide on how many burnouts. Racemaster will make final decision if need be. The drivers can burnout past the starting line. 11. Crossing the center line will result in disqualification, unless the race is over. 12. If a piece of your car comes off and goes into the other lane IN FRONT of your competitor you lose, unless the race is over. 13. There will be ONE 10 minute call to the lanes. When the time between rounds is up, you must be in the staging lane or you can be disqualified. 14. All cars must pass track safety inspection and meet the class rules outlined on the next page. Driver is required to wear all required safety gear, according to track policies. Track staff will have final say on safety inspection and must sign off on the tech card before a racer makes a pass down the track. SMALL TIRE SHOOTOUT - 100% payout, $200 Buy In. STREET CAR 7.0 - 100% Payout, $100 Buy In. Throttle stops and delay boxes allowed but MUST BE DISABLED! Wires and air must be disconnected from T-stop and delay box 0d out. At any time, you agree to give any track official or promoter full access to check. If you are caught with either operational you will be DQd from event and rest of season. NO EXCEPTIONS!! We are doing this so racers are not forced to rewire car or remove devices to run with us. DO NOT take advantage of this. No optical sensors, or down track displays will be allowed to determine placement on the track. STREET OUTLAWS INVITATIONAL GRUDGE RACING AND RACE YOUR WAY IN - Invite Only. *Top 16 who attend at least 7 events will qualify for the Finale $20k purse and Points Championship at Texas Motorplex. STREET CAR 7.0 - $2500 Guaranteed, $100 Buy In. FUTURE STREET OUTLAWS RACE - $5k Guaranteed, $500 Buy In. 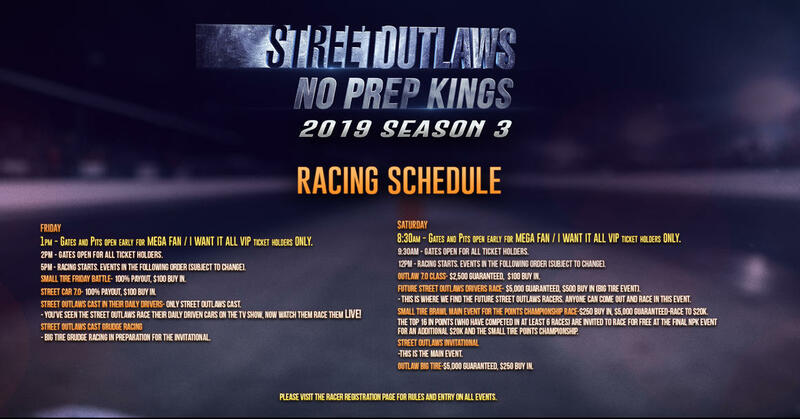 - At any time, any participant in this event, at the discretion of Producers, can be pulled into the Street Outlaws Main Event Invitational. Rules for this event mimic the Street Outlaws Invitational. 1.Is a heads-up 1/8th mile class. 2.The use of dual power adders is prohibited. Water injection permitted on Nitrous combo only. 3.All entries must maintain the factory wheelbase of year, make, and model being used, + or - 3 inches maximum and an external/outwardly appearance for year, make and model being used. 4.Cars must have factory dimension full steel roof, full steel quarters, and OEM Factory VIN tag affixed. Steel panel overlays prohibited. 5.OEM composite body (Corvette) and OEM composite roof panel (4th Gen Camaro/Firebird) permitted. 6.Cars must be able to pass NHRA tech for the weight and speed that the cars run. 7.Cars will be weighed each Race and must meet minimum weight limitations/specifications. 8.All cars must have neutral safety switch in working order. 9.All cars must have working taillights. 10.Front / side exit style headers must have turn ups or be directed away from starting line sensors. All boosted Ford Modular Motors/Engines may deduct 100lbs from their original base weight. All big block entries 585 cubic inches and smaller (Non 481X or Hemi) with a OEM bore space (4.84 Chevy, 4.900 Ford, and 4.800 Chrysler or smaller bore space) may deduct 100lbs from their original base weight. Cubic inch claims will be verified by P & G method. Cast block with cast head combo may deduct 50lbs from their original base weight. All entries using a small block engine have a maximum cubic inch size of 500 cubic inches. All engines 501 cubic inches and above will race in the big block category that their car fits. Mandatory every car must have an oil retention device. Any use of M3, M5, nitro-methane, polypropylene, and/or hydrazine are prohibited. Gasoline as defined by a mixture of hydrocarbons is permitted. The use of methanol fuel is for naturally-aspirated, turbocharged, and supercharged engine combinations. Methanol must be pure U.S. federal grades A or AA without the addition of additives, masking agents or any other substances. NPK Tech Dept reserves the right to check fuel at any time. Failure to pass fuel check is grounds for disallowance of the run and disqualification from the event during eliminations. 1.By measuring the housing bore at the leading edge of the impeller wheel. The maximum diameter of the housing bore at the leading edge of the impeller wheel may not exceed 2mm more than the maximum allowable turbocharger size permitted in this class. 2.By measuring the impeller inducer wheel where the leading edge of the inducer wheel meets the housing. The wheel/blade contour from the inducer to the exducer must be continuous without steps. The use of water, methanol or substance injection on any boosted vehicle is prohibited. Nitrous plates, bottles, solenoids or lines are not permitted on any vehicle unless nitrous is the sole power adder. Intercoolers are only allowed on centrifugal and turbocharged entries. Air-to-Air or Air-to-Water intercoolers are the only intercoolers permitted for gasoline powered entries. Air, water and ice are the only allowed substances in the intercoolers or the intercooler reservoirs. The use of any other agents is prohibited. Any transmission, torque convertor, and clutch permitted. Direct drives are prohibited. Driveshaft meeting SFI 43.1 spec is required. All vehicles must have a chassis that meets the guidelines set by SFI for their respective speed and elapsed time. A valid NHRA serialized chassis certification sticker is mandatory at an NHRA Member Track. NHRA license and chassis cert is accepted at ALL event locations. Minimum ground clearance is 3 from forward nose to 12 behind front spindles, including front exit style headers. Body must maintain an overall OEM factory style and appearance for year, make and model being claimed. Aftermarket front ends are permitted but must maintain an overall factory style, appearance and proportions. Front end external EXTENDER is permitted to achieve 47 overhang measured from center of spindle to front edge of external extender or front facia/bumper. Extended front ends that do not have factory style, appearance or proportions will be scrutinized and must be pre approved by NPK rules committee. Pro Mod style bodies, Top Sportsman style bodies, and heavily modified bodies that are modified in a drastic and visually perceptible manner for aesthetics, improved aerodynamics (example: sloped noses,laid back windshields) and/or wheel base advantage and do not have an external outwardly appearance of a factory stock model, will NOT be allowed to participate. (to be determined by Racemaster in consultation with Producer, NPK rules committee and compliance consultant). All entries must be self-starting from inside the vehicle. An operational master cut-off switch is mandatory. Each crew member must have the proper starting line credentials. When in the vehicle, from the ready line until the vehicle is safely stopped on the return road, the Participant driver is required to have and wear all industry standard and compliable safety restraint systems (including the helmet),which will be securely fastened in the vehicle at all times. A valid state or government issued drivers license beyond a learners permit is mandatory for cars running 10.00 (6.40) or slower. A valid NHRA competition license is mandatory for cars running 9.99 (6.39) or quicker. It is the Participants responsibility to familiarize themselves with the No Prep Kings class requirements as well as all NHRA safety requirements and general regulations. The Participant agrees they bear the ultimate responsibility when it comes to safety and how the Participant and the vehicle comply with the NHRA rule book. The Participant also agrees that no one else other than the Participant is in the best position to know about how their particular race vehicle has been constructed and how to safely operate it. Before proceeding with any builds or changes that do not fit within the exact guidelines of the NPK rules or are in a gray area, please submit proposed changes to NPK Rules Committee for approval. OUTLAWS - $5k Guaranteed - $250 Buy In. STREET OUTLAWS INVITATIONAL - Invite Only.